Tyddyn Mount is a small earthwork motte located on Tyddyn Farm about 2 miles southeast of Mold in northeast Wales. 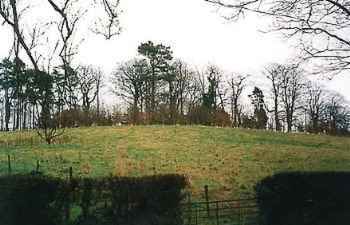 The site consists of a tree-clad motte, although the location of the bailey (if any) has been lost. There is no recorded history of the castle, although its proximity to the castle at Mold may be an indication that Tyddyn Mount served as an outpost or support site for this larger castle nearby. The motte’s dense tree cover means that the site is best viewed in the winter. On private land. Please seek permission before visiting.